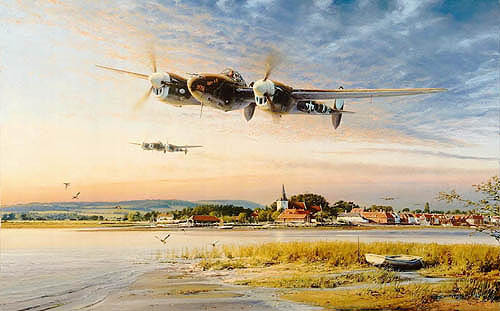 In Robert Taylor's panoramic painting, P-38J Lightnings of the 364th Fighter Group return from a strafing mission over France in the summer of 1944. Making their land-fall at just 100 feet, they skim across an estuary on England's south coast, near the old village of Bosham. With his unmistakable skill and vivid imagination Robert cleverly contrasts the exhilaration of the low-level combat flying, with the peaceful atmosphere of a quiet coastal setting, emphasising that curious blend of war and peace that was the daily lifestyle of the World War II flyer. This classic aviation painting provides collectors with a wonderful study of a memorable warbird. Each print is signed by FIVE Aces who flew the P-38 in combat in Europe.